In the constructions of many structures, bolts are used to hold structural parts together, and there can be many bolts in a model of a structure. It is important to be able to model the bolts and their interactions with the parts of the structure effectively. Some difficulties in modeling bolts are that each bolt has to carry a prescribed tension or shortening after its application, and the tightening of bolts is to be carried out in a given sequence in order to ensure an overall acceptable structural behavior. Since there can be many bolts in the structure, the modeling needs to be effective. In this News we briefly highlight the 3D-bolt option in ADINA. 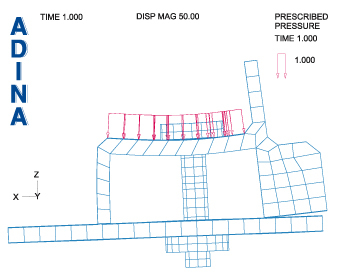 As shown in Figure 1, the program also offers the beam-bolt option but the accuracy of modeling a bolt is clearly higher when using the 3D-bolt feature. In both of these cases, the deformations of the rest of the structure are considered — meaning that after a bolt loading has been applied, the axial force in the bolt, or the reduction in length, has the given value and acts upon the rest of the structure, causing structural deformations. Using ADINA, of course, any number of bolts can be included in the model. The bolts can all be loaded simultaneously, or the bolts can be loaded sequentially. To introduce a 3D-bolt in the model, a 3D element group is designated as a 3D-bolt. 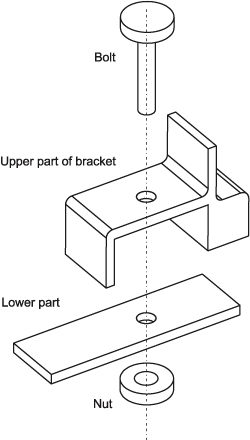 The direction of the bolt is defined by a cutting plane, and then the geometry of the 3D-bolt is arbitrary. The bolt can be governed by small or large displacements, small or large strains, the sides and faces of the elements representing the bolt can be straight or curved, and any material model, any number of nodes per element, and contact conditions can be used. The mixed u/p formulation and the incompatible modes formulation can be employed. The bolt loading can change from bolt tensioning to bolt shrinkage at different stages of the analysis. The bolts can be tightened/shrunk in a static analysis or an implicit dynamic analysis. An explicit dynamic analysis can be performed after a restart from a bolt loading in an implicit solution. A frequency analysis can be performed with the bolts in place, including the contact conditions. Bolts can be modeled with the heat flow options, for coupled TMC solutions, with the fluid-structure interaction options, for FSI solutions, and with the electromagnetic-structural interaction options to model Maxwell stress effects. 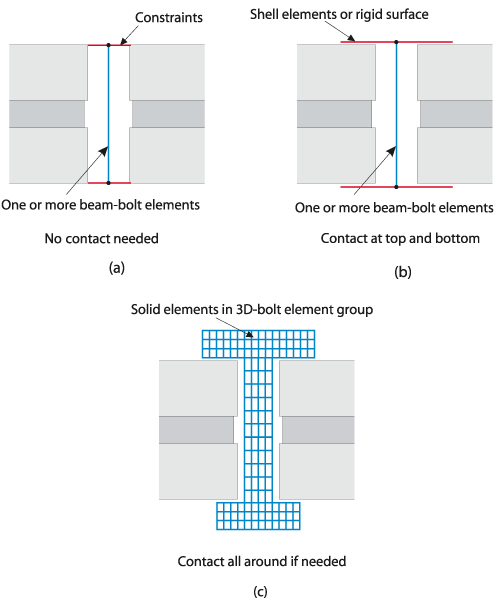 Figures 2 and 3 below are given to define a simple problem in which the 3D-bolt ADINA analysis feature is used. The two parts of the bracket are bolted together. After the parts are bolted together, the tension in the bolt is to be 2000 N and thereafter a pressure load is applied. In this model, the bolt and nut combination is modeled using a 3D-bolt element group, see Figure 4. The bolt element group and bracket element groups are allowed to come into contact. Some results of the analysis are given in Figures 5 and 6. The movie at the top shows the stress vectors in the bolt and nut. 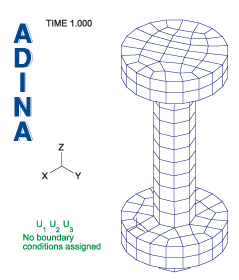 This capability of modeling bolts is a very powerful ADINA feature for structural analysis and is quite easy to use for the various analysis options mentioned above — including general nonlinear analyses and multiphysics simulations.